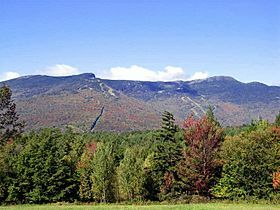 Mount Mansfield, at 4,393 feet (1,339 m), is the highest-elevation point in Vermont. Other high points are Killington Peak, Mount Ellen, Mount Abraham, and Camel's Hump. The lowest point in the state is Lake Champlain at 95 feet (29 m). The state's average elevation is 1,000 feet (300 m). The history of Vermont begins more than a million years ago. Vermont was covered with shallow seas periodically from the Cambrian to Devonian periods. Most of the sedimentary rocks laid down in these seas were deformed by mountain-building. Fossils, however, are common in the Lake Champlain region. Lower areas of western Vermont were flooded again, as part of the St. Lawrence Valley and Champlain Valley by Lake Vermont whose northern boundary followed the melting glacier at the end of the last ice age, until it reached the ocean. This was replaced by Lake Vermont and the Champlain Sea, when the land had not yet rebounded from the weight of the glaciers which were sometimes 2 miles (3.2 km) thick. Shells of salt-water mollusks, along with the bones of beluga whales, have been found in the Lake Champlain region. Lake Vermont connected to a glacial western lake near what is now the Great Lakes. They allowed western fish to enter the state, which is why Vermont has more native species than any other New England State, 78. About half of these are western in origin. Little is known of the pre-Columbian history of Vermont. Between 8500 and 7000 BC, glacial activity created the saltwater Champlain Sea. This event caused lamprey, Atlantic salmon, and rainbow smelt to become landlocked. Native Americans inhabited and hunted in Vermont. From 7000 to 1000 BC was the Archaic Period. During that era, Native Americans migrated year-round. From 1000 BC to 1600 AD was the Woodland Period, when villages and trade networks were established, and ceramic and bow and arrow technology were developed. The western part of the state became home to a small population of Algonquian-speaking tribes, including the Mohican and Abenaki peoples. Between 1534 and 1609, the Iroquois Mohawks drove many of the smaller native tribes out of the Champlain Valley, later using the area as a hunting ground and warring with the remaining Abenaki. French explorer Samuel de Champlain claimed the area of what is now Lake Champlain, giving to the mountains the appellation of les Verts Monts (the Green Mountains). Since in the French language adjectives normally come after the noun, the usual structure of this name would be "les Monts Verts." However, when an adjective is intended to be emphasized, it may be placed before the noun, which is the likely explanation for the origin of Vermont's name. It has been suggested that a possible alternative source of the name was "Vers Monts," meaning "towards mountains", so-called because Champlain approached the mountains from the relatively flat plains of Quebec. To aid and impress his new Abenaki allies, Champlain shot and killed an Iroquois chief with an arquebus, July 29, 1609. While the Iroquois were already enemies with the Abenaki, they formed a permanent enmity with the French with this incident, ultimately costing the French the bulk of their most developed possessions in the New World, including the contested area of most of Vermont, at the conclusion of the French and Indian War in 1763. France claimed Vermont as part of New France, and erected Fort Sainte Anne on Isle La Motte in 1666 as part of their fortification of Lake Champlain. This was the first European settlement in Vermont and the site of the first Roman Catholic mass. During the latter half of the 17th century, non-French settlers began to explore Vermont and its surrounding area. In 1690, a group of Dutch-British settlers from Albany under Captain Jacobus de Warm established the De Warm Stockade at Chimney Point (eight miles west of Addison). This settlement and trading post were directly across the lake from Crown Point, New York (Pointe à la Chevelure). There were regular periods of skirmishing between English colonies to the south and the French colony to the north, and the area of Vermont was an unsettled frontier. In 1704, De Rouville passed up the Winooski (Onion) River, to reach the Connecticut, and then down to Deerfield, Massachusetts, which he raided. During Father Rale's War, the first permanent British settlement was established in 1724 with the construction of Fort Dummer in Vermont's far southeast under the command of Lieutenant Timothy Dwight of Connecticut. This fort protected the nearby settlements of Dummerston and Brattleboro in the surrounding area. These settlements were made by people from Massachusetts and Connecticut. The second British settlement at Bennington in the southwest corner of Vermont would not be made until after 37 years of conflict in the region. In 1725, 60 armed men entered Vermont with rough maps, with the goal of attacking the Village of St. Francis, but turned back at Crown Point. In 1731, the French arrived at Chimney Point, near Addison. Here they constructed a small temporary wooden stockade (Fort de Pieux) until work on Fort St. Frédéric began in 1734. When this fort was completed, Fort de Pieux was abandoned as unneeded. There was another period of conflict from 1740 to 1748, the War of the Austrian Succession or King George's War. There were raids at a private defensive work, Bridgeman's Fort, in Vernon, Vermont. During the French and Indian War, 1755–1761, some Vermont settlers joined the colonial militia assisting the British in attacks on the French at Fort Carillon. Rogers' Rangers staged an attack against the Abenaki village of Saint-Francis, Quebec from Lake Champlain in 1759. Separating afterwards, they fled the angered French and Abenakis through northern Vermont back to safety in Lake Champlain and New Hampshire. Following France's loss in the French and Indian War, the 1763 Treaty of Paris gave control of the whole region to the British. Colonial settlement was limited by the British to lands east of the Appalachians, and Vermont was divided nearly in half in a jagged line running from Fort William Henry on Lake George diagonally north-eastward to Lake Memphremagog. Lands north of this line, including the entire Champlain Valley, were reserved for Indians. The end of the war brought new settlers to Vermont. The first settler of the grants was Samuel Robinson, who began clearing land in Bennington in 1761. In the 28 years from 1763 to 1791, the non-Indian population of Vermont rose from 300 to 85,000. A fort at Crown Point had been built in 1759, and the Crown Point Military Road stretched across the Green Mountains from Springfield to Chimney Point, making traveling from the neighboring British colonies easier than ever before. Three colonies laid claim to the area. The Province of Massachusetts Bay claimed the land on the basis of the 1629 charter of the Massachusetts Bay Colony. The Province of New York claimed Vermont based on land granted to the Duke of York (later King James II & VII) in 1664. The Province of New Hampshire, whose western limits had never been determined, also claimed Vermont, in part based upon a decree of George II in 1740. On March 5, 1740, George II ruled that Massachusetts's northern boundary in this area would be from a point near the Merrimack River due west (its present location). The boundary was surveyed by Richard Hasen in 1741, and Fort Dummer (Brattleboro), was found to be north of the line. Provisions and support for Fort Dummer were ordered by the Colonial Office from New Hampshire in the following years. New Hampshire's immensely popular governor, Benning Wentworth, issued a series of 135 land grants between 1749 and 1764 called the New Hampshire Grants. Many of these were in a large valley on the west (or New York side) of the Green Mountains and only about forty miles from Albany. The town was laid out in 1749 and was settled after the war in 1761. The town was named Bennington for Wentworth. The location of the town was well north of the Massachusetts limit set by decree in 1740, and east of the known eastern limit of New York, twenty miles east of the Hudson River. Ultimately, by 1754, Wentworth had granted lands for 15 towns. On July 20, 1764, King George III established the boundary between New Hampshire and New York along the west bank of the Connecticut River, north of Massachusetts, and south of 45 degrees north latitude. Under this decree, Albany County, New York, as it then existed, implicitly gained the land presently known as Vermont. Although disputes occasionally broke out later, this line became the boundary between New Hampshire and Vermont, and is the modern boundary. When New York refused to recognize land titles through the New Hampshire Grants (towns created earlier by New Hampshire in present Vermont), dissatisfied colonists organized in opposition, which led to the creation of independent Vermont on January 15, 1777. New York took the declaration of 1764 to apply retroactively, and considered the New Hampshire grants invalid. It therefore required land holders to purchase new grants for the same land from New York. New York then created counties in the region, with courthouses, sheriffs, and jails, and began judicial proceedings against those who held land solely by New Hampshire grants. In 1767, the Privy Council forbade New York from selling land in Vermont that was in conflict with grants from New Hampshire, reversing the 1764 decision. In 1770, Ethan Allen—along with his brothers Ira and Levi, as well as Seth Warner—recruited an informal militia, the Green Mountain Boys, to protect the interests of the original New Hampshire settlers against the new migrants from New York. A significant standoff occurred at the Breakenridge farm in Bennington, when a sheriff from Albany arrived with a posse of 750 men to dispossess Breakenridge. The residents raised a body of about 300 armed men to resist. The Albany sheriff demanded Breakenridge, and was informed, "If you attempt it, you are a dead man." The sheriff returned to Albany. When a New York judge arrived in Westminster with New York settlers in March 1775, violence broke out as angry citizens took over the courthouse and called a sheriff's posse. This resulted in the deaths of Daniel Houghton and William French in the "Westminster Massacre". In the summer of 1776, the first general convention of freemen of the New Hampshire Grants met in Dorset, Vermont, resolving "to take suitable measures to declare the New Hampshire Grants a free and independent district." On January 15, 1777, representatives of the New Hampshire Grants convened in Westminster and declared their land an independent republic. For the first six months of the republic's existence, the state was called New Connecticut. On June 2, a second convention of 72 delegates met at Westminster, known as the "Westminster Convention". At this meeting, the delegates adopted the name "Vermont" on the suggestion of Dr. Thomas Young of Philadelphia, a supporter of the delegates who wrote a letter advising them on how to achieve statehood. The delegates set the time for a meeting one month later. On July 4, the Constitution of Vermont was drafted during a violent thunderstorm at the Windsor Tavern owned by Elijah West. It was adopted by the delegates on July 8 after four days of debate. This was the first written constitution in North America to provide for the abolition of slavery (for adults), suffrage for men who did not own land, and public schools. (See also History of slavery in Vermont.) The tavern has been preserved as the Old Constitution House, administered as a state historic site. Violations of the abolition of slavery persisted for some time. In colonial times, like many of its neighboring states, Vermont's largest religious affiliation was Congregationalism. In 1776, 63% of affiliated church members in Vermont were Congregationalists. At that time, however, only 9% of people belonged to a specific church due to the remoteness of population centers. The battles of Bennington and Saratoga are recognized as the turning point in the American Revolutionary War. They were the first major defeat of a British army and convinced France that the American rebels were worthy of military aid. Stark became widely known as the "Hero of Bennington". "Bennington Battle Day" (the anniversary of the battle) is a legal holiday in Vermont. Under the portico of the Vermont Statehouse, next to a heroic granite statue of Ethan Allen, there is a brass cannon that was captured at Bennington. The Battle of Bennington, fought on August 16, 1777, was a seminal event in the history of the state of Vermont. The nascent republican government, created after years of political turmoil, faced challenges from New York, New Hampshire, Great Britain and the new United States, none of which recognized its sovereignty. During the summer of 1777, the invading British army of General John Burgoyne slashed its way southward through the thick forest, from Quebec to the Hudson River, captured the strategic stronghold of Fort Ticonderoga, and drove the Continental Army into a desperate southward retreat. Raiding parties of British soldiers and native warriors freely attacked, pillaged and burned the frontier communities of the Champlain Valley and threatened all settlements to the south. The Vermont frontier collapsed in the face of the British invasion. The New Hampshire legislature, fearing an invasion from the west, mobilized the state's militia under the command of General John Stark. General Burgoyne received intelligence that large stores of horses, food and munitions were kept at Bennington, which was the largest community in the land grant area. He dispatched 2,600 men, nearly a third of his army, to seize the colonial storehouse there, unaware that General Stark's New Hampshire troops were then traversing the Green Mountains to join up at Bennington with the Vermont continental regiments commanded by Colonel Seth Warner, together with the local Vermont and western Massachusetts militia. The combined American forces, under Stark's command, attacked the British column at Hoosick, New York, just across the border from Bennington. General Stark reportedly challenged his men to fight to the death, telling them that: "There are your enemies, the redcoats and the Tories. They are ours, or this night Molly Stark sleeps a widow!" In a desperate, all-day battle fought in intense summer heat, the army of Yankee farmers defeated the British, killing or capturing 900 men. Burgoyne never recovered from this loss and eventually surrendered at Saratoga on October 17. In 1778, David Redding, convicted of being a traitor to the colonies and a spy for the British, was hanged in Bennington. The first printing press in the state was established in Dresden in 1779. Vellum manuscript of the Constitution of Vermont, 1777. This constitution was amended in 1786, and again in 1793, two years after Vermont's admission to the federal union in 1791. 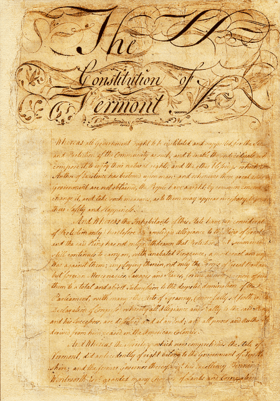 See Constitution of Vermont (1777) and Constitution of Vermont. Vermont continued to govern itself as a sovereign entity based in the eastern town of Windsor for 14 years. Thomas Chittenden acted as chief magistrate of Vermont from 1778 to 1789 and from 1790 to 1791. In the 1780s Chittenden, the Allen brothers, and other political leaders engaged in negotiations with Frederick Haldimand, the British governor of Quebec over the possibility of Vermont becoming a British province. These negotiations ultimately failed in part due to the timely surrender of Cornwallis at Yorktown in 1781. The first General Assembly voted to establish two counties, Bennington in the west and Unity in the east. It adopted the common law of England as the basis for its legal system. It voted to confiscate Tory lands and sell them to finance the militia. This was the first "tax" passed in the state. The first newspaper was published in the state in 1781, the weekly Vermont Gazette. In 1784, the state established a postal service linking several towns and Albany, New York. In 1786, the Vermont governor replied to requests from Massachusetts about the Shays' Rebellion, saying that he was willing to extradite members of the rebellion, though his response was "pro forma" only since the state could ill afford to discourage immigration. The gold leaf dome of the Vermont State House in Montpelier is visible for many miles around the city. This is the third State House on the site, and like the second, was built in the Greek Revival architectural style. It was completed in 1857. Montpelier became the state capital in 1805. In 1791, Vermont joined the federal Union as the fourteenth state—becoming the first state to enter the Union after the original thirteen colonies, and as a counterweight to slaveholding Kentucky, which was admitted to the Union later the same year. In June 1791, Thomas Jefferson and James Madison toured the state. Because of the proximity of Canada, Vermonters were somewhat alarmed during the War of 1812. Five thousand troops were stationed in Burlington at one point, outnumbering residents. About 500 of these died of disease. An expeditionary force of Quebec Eastern Townships' volunteers destroyed a barracks built at Derby with no personnel casualties. The war, fought over what seemed like obscure maritime considerations to landlocked Vermont, was not popular. In July 1830, the state experienced what turned out to be the worst flood of the 19th century. It was called the "Torrent of 1830." Merino sheep were introduced in 1812. This ultimately resulted in a boom-bust cycle for wool. Wool reached a price of 57 cents/pound in 1835. By 1837, there were 1,000,000 sheep in the state. The price of wool dropped to 25 cents/pound in the late 1840s. The state could not withstand more efficient competition from western states, and sheep raising collapsed. In 1846, the ground was broken for the construction of the first railroad in Vermont, Central Vermont Railway, in Northfield. In 1853, Vermont passed a strict law prohibiting the consumption of alcoholic beverages. Some towns followed the law, while others ignored it. French-Canadian migration started before the Civil War and accelerated during the 1860s. By 1860, the state was a leading producer of hops in the nation with 640,000 pounds (290,000 kg), second to New York. This crop conveniently arrived as a replacement for the disappearance of the Merino sheep trade. Hops, too, disappeared. A number of factors were involved: plant disease in 1909, migration of planting to California from 1853–1910, where growing was performed more efficiently, and Prohibition both at the state and national level. An 1854 Vermont Senate report on slavery echoed the Vermont Constitution's first article, on the rights of all men, questioning how a government could favor the rights of one people over another. The report fueled growth of the abolition movement in the state, and in response, a resolution from the Georgia General Assembly authorized the towing of Vermont out to sea. The mid to late 1850s saw a transition from Vermonters mostly favoring slavery's containment, to a far more serious opposition to the institution. As the Whig party shriveled, Vermont changed its allegiance to the emergent Republican Party. In 1860, it voted for President Abraham Lincoln, giving him the largest margin of victory of any state. More than 28,100 Vermonters served in Vermont volunteer units. Vermont fielded 17 infantry regiments, one cavalry regiment, three light artillery batteries, one heavy artillery company, three companies of sharpshooters, and two companies of frontier cavalry. Instead of replacing units as they were depleted, Vermont regularly provided recruits to bring the units in the field back up to normal strength. Many of the soldiers had never been out of their own county, much less the state. In the South, they felt like they were on another planet. In 1863, there was rioting in West Rutland after the state instituted a draft. Nearly 5,000 Vermonters served in other states' units, in the United States Army or the United States Navy. The 54th Massachusetts Infantry (Colored) included 66 Vermont blacks; a total of 166 black Vermonters served out of a population of 709 in the state. Vermonters, if not Vermont units, participated in every major battle of the war. Vermonters suffered a total of 1,832 men killed or mortally wounded in battle; another 3,362 died of disease, in prison or from other causes, for a total loss of 5,194. More than 2,200 Vermonters were taken prisoner during the war, and 615 of them died in, or as a result of, their imprisonment. 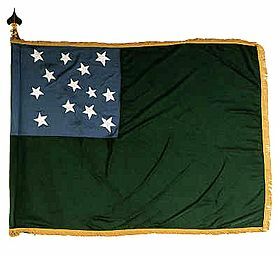 Among the most famous of the Vermont units were the 1st Vermont Brigade, the 2nd Vermont Brigade, and the 1st Vermont Cavalry. A large proportion of Vermont's state and national-level politicians for several decades after the Civil War were veterans. The two decades following the end of the American Civil War (1864–1885) saw both economic expansion and contraction, and fairly dramatic social change. Mills in Lowell, Massachusetts began staffing up. Recruiters were sent out all over New England. Initially they found ample workers from new widows, single parent heads of family. This demand was filled by August 1865, and recruiting Americans from Lowell ceased abruptly. Vermont's system of railroads expanded and was linked to national systems, agricultural output and export soared and incomes increased. But Vermont also felt the effects of recessions and financial panics, particularly the Panic of 1873 which resulted in a substantial exodus of young Vermonters. The transition in thinking about the rights of citizens, first brought to a head by the 1854 Vermont Senate report on slavery, and later Lincoln's Gettysburg Address in changing how citizens perceived civil rights, fueled agitation for women's suffrage. The first election in which women were allowed to vote was on December 18, 1880, when women were granted limited suffrage and were first allowed to vote in town elections, and then in state legislative races. Starting around 1870, a number of Vermont towns dressed satirically for Independence Day in an Ancient and Horribles Parade. The intent was to deride politicians and other well-known figures. This largely died out by 1900. In 1902, Vermonters approved a law for local option on the sale of alcoholic beverages, countermanding the prior law of 1853 which banned them entirely. That year 94 towns approved the sale of alcoholic beverages locally. The number of approving towns fell each year until there were only 18 in 1917, shortly before national prohibition became law. In 1923, the state passed a law limiting the regular workweek of women and children to 58 hours. The US Supreme Court decided that New Hampshire's boundary included most of the Connecticut River, establishing Vermont's eastern boundary in Vermont v. New Hampshire – 290 US 579 (1934). A eugenics project apparently targeted Indians, Indian-French Canadians, and Afro-Americans in the state for forced sterilization between 1931 and 1936. Hydropower supplied 90% of the state's power needs in 1940. About 6,000 Vermonters were in the military during World War II. About 874 of these died. 94 Vermonters died fighting the Korean War. Widespread use of DDT to exterminate insect pests after the war led to the reduction of various wildlife, noticeably birds and larger wildlife, such as moose and bear. The pesticide was banned in 1972 eventually leading to the restoration of many birds and larger mammals. For example, the bear population doubled from the 1980s to 6,000 in 2013. In 1964, the US Supreme Court forced "one-man, one-vote" redistricting on Vermont, giving cities an equitable share of votes in both houses for the entire country. Until that time, counties were often represented by area in state senates and were often unsympathetic to urban problems requiring increased taxes. In 1965, the Northeast Blackout of 1965, the worse blackout until then, left Vermont without electricity for about 12 hours. In 1968, the state took over welfare support for the indigent. This had formerly been the responsibility of the towns, under the Overseer of the Poor. This had been a nearly insupportable burden for many small towns. In 1984, the state had 2,500 square miles (6,500 km2) in farmland. This declined to 1,900 square miles (4,900 km2) in 2013. On April 25, 2000, as a result of the Vermont Supreme Court's decision in Baker v. Vermont, the Vermont General Assembly passed and Governor Howard Dean signed into law H.0847, which provided the state-sanctioned benefits of marriage to gay and lesbian couples in the form of civil unions. Controversy over the civil unions bill was a central issue in the subsequent 2000 elections. In 2007, with three-quarters of the state opposing the Iraq War, the state nevertheless had the highest rate of deaths in the nation. This was due to volunteers and participation by the Vermont National Guard. During the late-2000s recession, state median household income dropped furthest, or second furthest, depending on how it is computed, of any state in the nation; from −3.2% or −10%, depending on whether a two-year or three-year moving average was used. In 2011, Tropical Storm Irene caused widespread flooding, particularly in the southern part of the state, closing at least 260 roads. Federal assistance for recovery included $110 million for emergency relief and assistance, $102 million for federal highway repair, and $23 million for individual assistance within the state. Though some members of the Federalist Party found electoral success, in its early years of statehood Vermont generally preferred the Jeffersonian Party, which became the Democratic Party in the early 1820s. Vermont stopped voting Democratic in the 1830s, initially over a fear of Jacksonian return to political parties; later, perhaps, over increasing opposition to the spread of slavery. The state voted Anti-Jackson, Anti-Masonic, Whig, and then Republican Party. The Vermont legislature chose presidential electors through the general election of 1824. Vermont citizens first started voting directly for presidential electors in 1828. In the 1830s Vermont was one of the strongholds of Anti-Masonry. While the party elected only one Governor, William A. Palmer, it was able to prevent the other major parties from winning majorities in some statewide races, which meant that the Vermont General Assembly chose the winner. From the founding of the Republican party in the mid-1850s until the 1958 election of William H. Meyer to the United States House of Representatives, Vermont elected only Republicans to statewide office. Politicians aspiring to statewide office in Vermont normally had to be nominated at a state convention or "caucus." Factions dominated these caucuses. Some of these were family. A look at the list of Governors, Senators and Representatives over time shows the Chittendens, Fairbanks, Proctors, and Smiths. Nomination was tantamount to election. The state legislature chose US senators until 1913. Up to six seats in the US House of Representatives gave ambitious politicians an ample stage for their talent. Until 1870, all state officials were elected for one-year terms. In 1870, the term was changed to two-years. Governors then normally served just one term of two years. The Green Mountains effectively split Vermont in two. Culturally the eastern Vermonters were often descended from immigrants from New Hampshire. Western Vermonters often had their roots in New York. Recognizing this as a source of potential problems, politicians began following an unwritten "mountain rule", rotating the Lieutenant Governor and Governor residing in opposite sides of the state. The first election in which women were allowed to vote was on December 18, 1880, when women were granted limited suffrage and were allowed to vote in school board elections. General annoyance with this system of selecting leadership by a few people, led to statewide primaries in 1916. Down to only one congressional seat to compete for, Governors started trying to serve two terms, beginning with Governor Weeks in 1927. This worked until World War II. Senator Ernest Gibson died in 1940. Governor George Aiken, a liberal ally of the Gibsons appointed the late Senator's son, Ernest W. Gibson, Jr.to fill the seat until a special election for the remainder of the term. The younger Gibson did not run, enabling Aiken's election to the seat. Instead Gibson devoted himself to preparing the state for entry into World War II. He served in the South Pacific and emerged as a highly decorated Colonel. There was a tsunami in 1946 in American politics. Returning veterans were popular. Gibson ran an unprecedented campaign against the incumbent Governor, Mortimer R. Proctor, and ousted him in the primary. Gibson won the general election, won reelection in 1948, and served until resigning in 1950 to accept appointment as Judge of the United States District Court for the District of Vermont. The elder Gibson, a former member of the Progressive Party, was the first of the liberal Republicans. While conservatives like Harold Arthur and Lee E. Emerson were elected Governor, they seem, in retrospect, to be transitory figures. The "normal" path to the governorship for Republicans, which Ernest Gibson, Jr. explicitly campaigned against in 1946, was to serve in the Vermont House of Representatives and hold a leadership position such as Speaker of the House; service in the Vermont State Senate and a leadership role such as President Pro Tem; election to the Lieutenant Governor's office; and election as Governor. Successful Republican candidates for the United States House of Representatives and United States Senate were also almost always veterans of leadership positions in the Vermont Legislature or statewide office. In 1962, Philip Hoff was elected Governor, the first Democrat since before the Civil War. The demographics of the state had changed. In 1960, 25% of the population was born outside the state. Most of these immigrants were from Democratic states and brought their voting inclinations with them. Anticipating this change, the Republicans conducted a massive free-for-all in 1958, the last good chance many of them saw to capture a congressional seat. They were wrong. Democrat William H. Meyer won, the first from his party in 102 years. While the climate had changed, the legislature had not. With one representative per town and two senators per county, the rural areas dominated and set the agenda much to the frustration of urban areas, particularly Chittenden County. In 1964, the US Supreme Court forced "one-man, one-vote" redistricting on Vermont, giving cities an equitable share of votes in both houses. Unlike yesteryear, no party nominee can be assured of election. The unwritten "two term" rule has been jettisoned. Governors usually serve as long as they can, not being able to guarantee that their policies will be continued after they leave office. Vermonters have alternated parties in the Governor's office since 1962. Democratic governors have served longer. Transportation around this mountainous state was a challenge to the original colonists. While this challenge has been met in the current era by turnpikes and limited rail service, public transportation for the majority of Vermonters has often remained elusive. The state highway system was created in 1931. In 2008, the Vermont Transit Lines, a subsidiary of Greyhound Lines went out of business. It had begun operating in 1973. Limited service continued under the direct aegis of Greyhound. This has been replaced by subsidized regional NGO corporations which provide limited service for most, but adequate service for those needing medical treatment. History of Vermont Facts for Kids. Kiddle Encyclopedia.